The effect of building collapse is enormous but because it kept repeating itself, in majority of times in the same method, it seems as government is not doing enough to check it. The opinion that government is not doing enough stemmed from the fact that live is becoming cheap that after mourning victims of an incident, in no distance time, another one happens and it also goes into archives. Some postulations have been made pointing to why building collapse would continue to be with us. Many people really detest the horror of beholding building collapse where casualties are recorded, yet little efforts have been put in the fireworks to eradicate the scourge. The fact that people don’t like building collapse does not mean, it will not happen even if nothing is done to forestall the incident. This is because factors contributing to building collapse in Lagos are similar to that in Abuja, Port Harcourt and other major cities in the country. It has been a major concern in Nigeria as it threatens human lives and properties because of its occurrence at close intervals. People erect buildings without considering some factors and codes which are necessary to put in place before embarking on any development and this, calls for a reason to emphasize on the remedies to put an end to these disasters. Experts have posited various factors responsible for the incessant causes of building collapse in Nigeria. 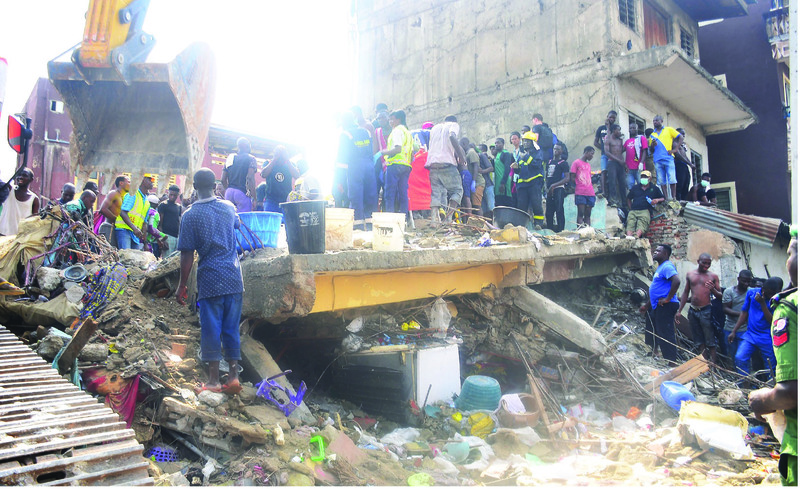 According the experts, the use of substandard materials, coupled with the activities of quacks which have inexorably contributed to the incidence of building collapse. Some of the major causes of building collapse include but not limited to bad design, fire, lack of proper supervision, faulty construction and alteration of approved drawings etc. as well as the effects and problems caused by building collapse. Useful suggestions were proffered as corrective measures. Also far reaching recommendations have been made, even though they are not adhered to by developers and project supervisors. Following the collapse of the five-storey building under construction in Lekki, there have been outcry for residents in Lagos State for relevant authorities to sit up and address the issue in order to avoid a repeat. The sad incident which occurred at Horizon 1, Lekki Gardens, Ikate around a couple of years ago claimed 30 lives, while 13 more were rescued from the rubble by workers from the Lagos State Emergency Management Agency and the National Emergency Management Agency. Such waste of lives and dreams can be avoided if society buckles up and focuses on key issues relating to structural development of buildings both in residential and official parts of the Lagos metropolis and other cities nationwide. Everyone has a part to play. Several studies show that buildings cave in as a result of factors such as inefficiency on the parts of workmen as well as unprofessional attitudes towards erecting and maintaining structures in the state. Some building engineers and contractors tend to believe everything is about profit-making and in a bid to cut corners they end up creating a hazard for many others who get to occupy these properties afterwards. In Nigeria like any other countries in the world, building collapse menace is growing at an alarming rate, seemingly uncontrollable or beyond control. The incessant buildings collapse in Nigeria has become a great concern to all the stakeholders and the professionals in the building industry, government, private developers, clients and users, as well as the residents. Fall out of these ugly concern about the increasing incidents of collapse building nation-wide form the basis for which experts look to find out the major causes and probable remedial measures to collapse of buildings in Nigeria. Many lives and properties have been lost in the collapse of buildings mostly in Port Harcourt, Abuja and Lagos respectively. Many property owners have developed high blood pressure and some have been sent to an early grave. According to Windapo, “frequent types of buildings that collapse are residential buildings which are either on two, three or four floors.” In the words of Dada, “Structural Failure has become recurring decimal, a worrisome menace nightmare and an enduring embarrassment”. The horrifying scene of structural failure is no longer news breaker this time around. Really, incidents of collapsed buildings, collapsed bridges or collapsed structures of various types are not peculiar to Nigeria alone. But the current situation is becoming more rampant and embarrassing, most especially as it relates to Lagos State where there are more high rise buildings springing up on a daily bases. The aggregate percentage of building collapse occurrence between 1987 and 1992 and between 1993 and 1998 was the same as well as annual percentage of reported cases within the same period. The same happened between year 2000 and up to date. This implies that, between 1987 and 1992, 13.68 per cent of the total collapse occurred; the same between 1993 and 1998. But 1987 recorded the highest frequency of collapse between 1987 and 1992 with a frequency of 7 cases, about 5 per cent of the total period and 37 per cent for the class interval. Within the interval, 1991 has the lowest reported cases of 2 amounting to about 10 per cent. 1995 appears to be the modal year in reported cases of collapse between 1993 and 1998 when 8 cases were recorded which amounts to 5.76 per cent of the total and over 42 per cent for the class interval. The least frequency of 1 case, about 0.72 per cent occurred in 1993. The class interval that witnessed highest number of reported cases was between 1999 and 2003 followed by 2004 and 2008. Professionals are more concerned that we have kept adding to the list when we should be making history of them all. Government should therefore change the style of controlling building collapse since the system hitherto in use has failed and not giving any positive result.